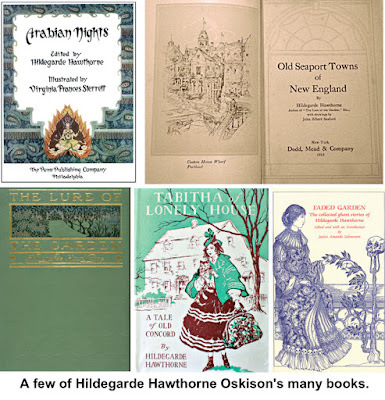 In 1950, when Hildegarde Oskison had turned 79 years old and had written nearly two dozen books, she announced that she would retire from writing and commence to enjoy what others had written. She did not, however, retire from community involvement and continued to attend Ridgefield Town Meetings and First Congregational Church activities and could be seen each day walking to the post office from her home on East Ridge and later, The Elms Inn. 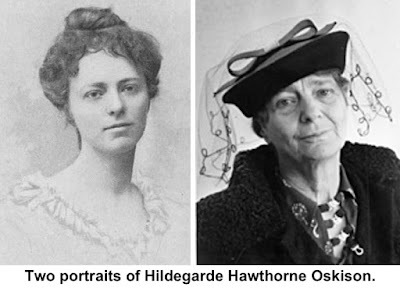 During her long career, Oskison had probably out-produced her more illustrious grandfather, publishing 23 books and many newspaper and magazine pieces, usually under her maiden name, Hildegarde Hawthorne. One of Nathaniel Hawthorne’s seven grandchildren, Hildegarde Hawthorne was born in New York City in 1871 but spent much of her youth growing up in England, Germany, Jamaica, and Long Island — her father, Julian Hawthorne, was a journalist, novelist and poet who moved around a lot. She had little formal education, outside of tutors and her parents, but clearly had inherited her family’s love of writing. When she was only 16, her first short story was published in St. Nicholas, a magazine for children, and she continued to write for young people throughout her life. “The Romantic Rebel,” and others on Oliver Wendell Holmes, Henry Wadsworth Longfellow, Ralph Waldo Emerson, and Henry David Thoreau. 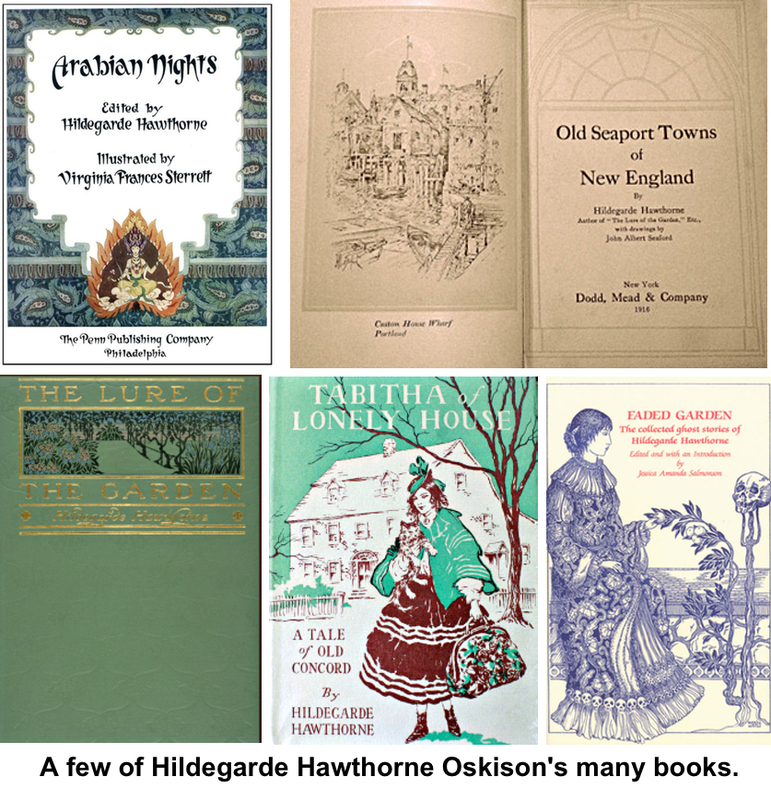 She also wrote six Westerns aimed at young readers, several histories, a book on gardening, and many travelogues. In 1920, she married John Milton Oskison (1874–1947), a writer and journalist who was the first person of American Indian descent to graduate from Stanford University. They lived for many years in California where Hildegarde became a frequent hiker and camper, and often established friendships with both backwoodsmen and American Indians. She produced three books on California and used her wilderness experiences in writing her Westerns. 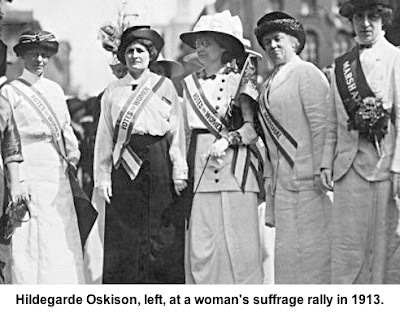 During World War I, Oskison assisted the soldiers by serving with the YWCA troop support services in France and with the Red Cross. At the same time, she provided dispatches to The New York Times and The New York Herald about aspects of the war she was witnessing. In the 1920s she also wrote many book reviews for both papers. She came to Ridgefield around 1940, living on East Ridge; by then, she had been separated from her husband. By the late 1940s, she had moved to The Elms Inn on Main Street. She died in 1952 at the age of 81. Her last article, written for Reader’s Digest when she was nearly 80 years old, described her aunt, Rose Hawthorne Lathrop, a writer who after a troublesome marriage to an alcoholic who died of cirrhosis, became a Catholic nun. In 1901, as Mother Mary Alphonsa, O.P., Rose Hawthorne established the Rosary Hill Home for terminally cancer patients, which still operated today in Hawthorne, N.Y., by an order of nuns that she founded.